uPlay Tablet has been re-certified as Ainol’s official distributor in North America for 2013 to 2014. uPlay Tablet became Ainol’s official distributor in 2012. Ainol Electronics, Ltd. was founded in 2004 in Shenzhen, China, and is a household name in China for MP3 and MP4 players. Ainol has it\’s own RD, development, manufacturing facility and sales team. Ainol\’s factory in Shenzhen has more than 32,000 square meters, with state-of-art manufacturing, assembling, and testing equipment. Ainol entered the Android tablet market in 2010, and have released a number of very popular tablets , such as the Ainol NOVO 7 Basic, NOVO7 Advanced. 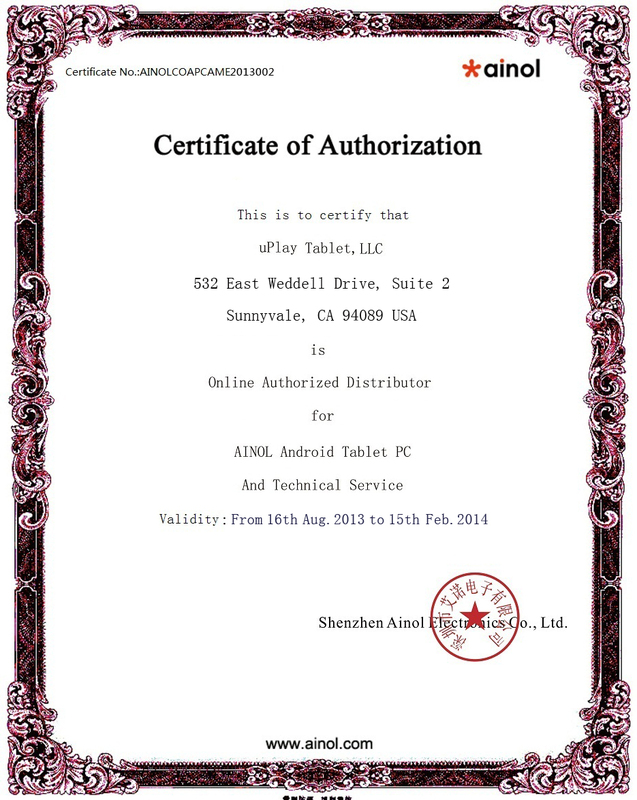 In December 2011, Ainol released the first Google authorized Android 4 .0 tablet NOVO 7 Paladin based on the MIPS CPU. Then in January 15, 2012, Ainol released another two Android 4 .0 tablets NOVO 7 ELF and NOVO 7 Aurora, both based on AllWinner ’s ARM based many-core CPU A10. NOVO 7 Aurora is the first 7″ tablet with the IPS screen . NOVO 7 Android 4 .0 tablets won the second place of the “Best Tablet Award” at Consumer Electronics Show (CES) held in Las Vegas in January, 2012. As Ainol’s official distributor we offer the lowest wholesale price on Ainol tablets. You will enjoy the factory price when you order 100 units of a model. We also have an Ainol retailer program, where we offer retailers the lowest whole price for ordering 10 units of a model. If you are interested in selling Ainol tablets or buying Ainol tablets in volume, please contact uPlay Tablet.